These Mediterranean inspired vegetables are the perfect accompaniment to grilled chicken, or meat. I’m always looking for ways to feed my family healthy meals that can be prepared in under a half an hour. Don’t get me wrong, I love cooking, but since I work full-time, I like to save my “slow-cooking” for the weekends. 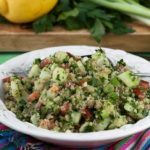 Since we try and eat gluten free as much as possible, these simple Mediterranean Vegetables are not only quick, but Whole30 compliant, Paleo and gluten free. Serve as an accompaniment to Grilled Chicken. 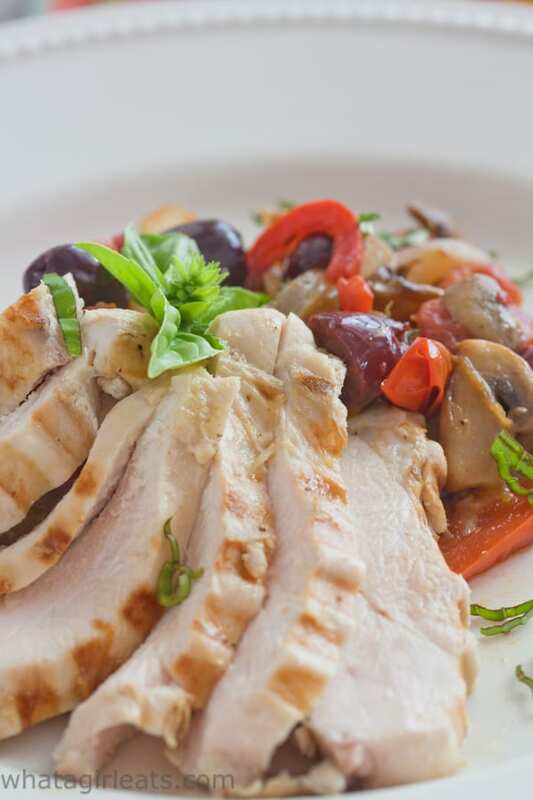 Mediterranean style vegetables are stir-fried for a quick and flavorful accompaniment to grilled chicken or beef.Whole30 compliant, paleo and gluten free. I make the sauce/marinade first, reserving 1/4 cup for the chicken (or meat). While the chicken is marinating, prepare the veggies. You can grill the chicken, or to save time, use an indoor grill (which is also a panini press) like this one. (This is an affiliate link for which I make a small percentage, at no additional charge to you). 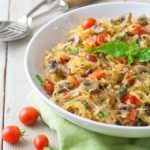 Although this is somewhat reminiscent of ratatouille, there is no lengthy cooking time, and no eggplant, which isn’t a favorite vegetable in our house! It’s full of flavor, with plenty of garlic, onions, tangy Kalamata olives, and a handful of fresh basil. 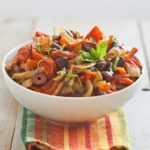 And if you’re not watching carbs, or have a carb loving spouse or children, you can also toss these Mediterranean Vegetables with gluten free or regular pasta too. Just like Asian Stir-fries, this cooks quickly, so have all the vegetables prepared before beginning. You can find pre-sliced onions and mushrooms to make this even faster. Although it may seem like a lot of steps, I add the vegetables one or two at a time depending on how long it takes to cook them. Start with the onions, which require more cooking time and finish with the olives, which just need a minute to heat up. These flavorful, Mediterranean style vegetables can be served as a side dish or an accompaniment to grilled chicken, meat or fish. Paleo, Whole30 and Gluten free. 3 Tablespoons fresh basil cut chiffonade. In a large sauté pan, heat oil over medium high heat until shimmering. Add the onions and bell peppers and stir fry 1-2 minutes. Add mushrooms and continue sautéing another 2 or 3 minutes. Add tomatoes and stir another minute or two, just until they burst slightly and give off their juices. Toss in olives and fresh basil. Check for seasoning. First mix the lemon juice olive oil and garlic together first, and while the chicken is marinating, prep the vegetables. Use the reserved marinade/dressing to drizzle over the chicken or veggies. This simple lemon and garlic marinade is perfect for chicken. Pour over chicken. Allow to marinate for 30 minutes or up to 8 hours. Cook chicken over hot grill, or broil in oven, until done, about 5 per side. My daughters will eat this as a between-meal snack, straight out of the fridge! What would you serve these Mediterranean Vegetables with? 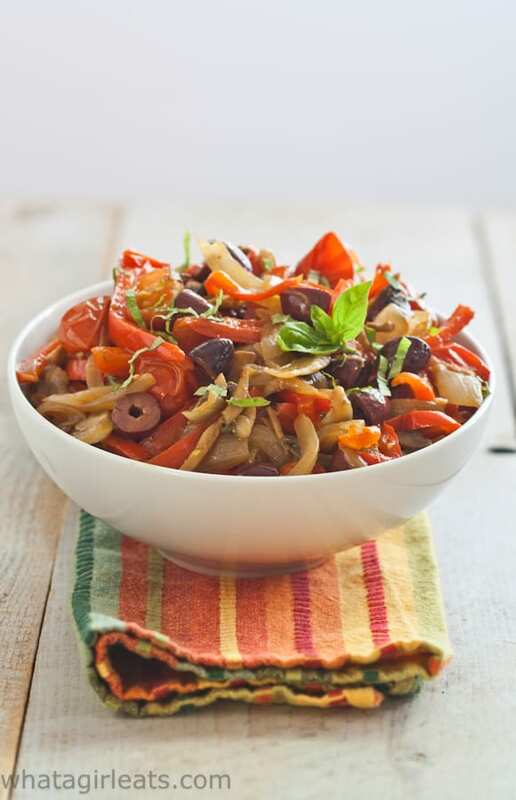 Mediterranean style vegetables are stir-fried for a quick and flavorful accompaniment to grilled chicken or beef. Whole30 compliant, paleo and gluten free. I really need to incorporate some healthy meals back into my life… Too many pizzas, cookies and the like! This looks perfect to get me back in the groove! Ha! True! My girls are older now, so they enjoy eating lots of veggies and few carbs…it’s good for all of us! 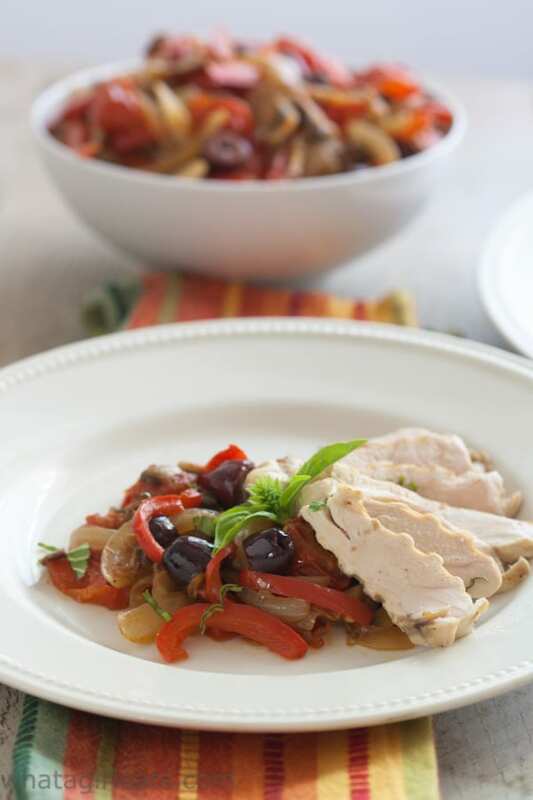 I am all about Mediterranean flavors so this is the perfect recipe for me! Currently traveling around the Amalfi coast in Italy so have been eating a ton of eggplant, peeppers, and all sorts of grilled veggies and olives. Mediterranean flavors are the best! I agree and so much healthier! I love all of the flavors you’ve used in this recipe. I’m sure this is something that will be appreciated in my home. Can’t wait to try it. Love Love vegetables prepared this way. They go great with any grilled meat and are a perfect companion dish for summer. Easy to make and delicious to eat. 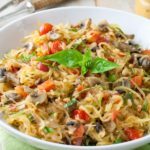 This looks so delicious and perfect for a busy weeknight dinner! Love that it’s ready in under 30 minutes! Mediterranean flavors of some of my fav! This is a must make! My daughters just ate them cold out of the fridge! I all about veggie sides that are easy to make and pack tons of flavor! This looks so good, and I love that the marinade can also be used as a dressing, so less work to do! yes they do! We use leftovers in sandwiches and salads! 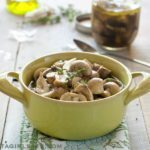 I love Mediterranean recipes! They are so healthy and delicious!